Input text: the large pink statue is on the turquoise ground. the shiny pedestal is 3 inches to the right of and 2 inches behind the statue. the huge dutch iris is two inches to the left of the statue. a plant is 4 inches to the left of the dutch iris. the large century plant is 1 foot to the left of and 1 foot behind the statue. the huge geranium is 18 inches to the right of the statue. the huge laptop computer is on top of the pedestal. a very huge phone is 2 inches to the left of the geranium. the phone is facing right. a huge shiny cassette is 3 inches to the left of and 2 inches in front of the statue. the [city] sky is pink. a city is in the background. there is a very huge shiny [stripe] ball 35 feet behind and 12 feet to the left of the statue. the ball is 7 feet above the ground. there is a large potted plant 2 feet in front of the phone. a blue computer is 3 inches in front of the statue. a huge flaming sword is 2 feet behind and 1 foot to the left of the statue. a large flamingo lily is 2 inches in front of the cassette. a plant is in front of the flamingo lily. a large guzmania is 1 foot behind the pedestal. a green light is 5 feet above and 10 feet behind the statue. a purple light is 10 feet in front of and 2 feet to the left of the statue. a pink light is 5 feet in front of and 2 feet to the right of the statue. a palm tree is 6 feet behind and 4 feet to the left of the ball. the palm tree is on the ground. a large palm tree is 30 feet behind the ball. the large palm tree is on the ground. a large radio is 1 foot to the left of the cassette. a large purple "CD-ROM" is 6 feet behind the statue. the "CD-ROM" is 16 feet above the ground. a purple "versace" is 5 feet behind and 7 feet to the left of the statue. 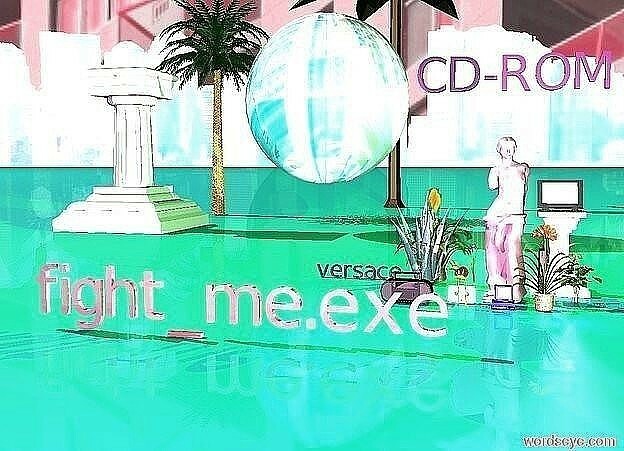 large shiny fuschia "fight_me.exe" is 15 feet in front of and 1 foot to the left of the statue. A huge pedestal is 10 feet to the left of the ball. the huge pedestal is on the ground. a cup is on the huge pedestal.